Defending Europe: Global Britain’ and the Future of European Geopolitics highlights Russian aggression, Chinese expansionism and the United States’ ongoing pivot towards the Indo-Pacific as external challenges to the European security order. However, it also points out how Germany and France are starting to use British withdrawal from the European Union to challenge some of the basic assumptions which have underpinned European security since the Second World War, which could expose the faultlines long buried by NATO, leading to a decoupling of the EU from NATO and the wider Atlantic order. Consequently, the report calls for the United Kingdom to launch and lead a “European Defence Initiative” to shape the defence of the European continent and maintain its alignment with NATO. 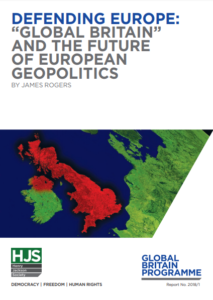 This is a scholarly and robust attempt to ensure that the further development of European political integration, after Brexit, does not result in estrangement between the United States and Continental Europe. However, the goal of Britain working with an elite group of other European states which meet the NATO minimum of spending 2 per cent of GDP on Defence – while attractive and ambitious – will depend on such states investing much more in future than they have traditionally been willing to do. This thought-provoking report does a great job of locating the dilemmas currently facing the UK in the context of the longer history of British foreign policy. It reminds us that geography matters and that “Global Britain” is only possible if there is a favourable environment in Europe. Britain’s withdrawal from the EU sharpens an already acute security challenge. Russia is back menacing Europe; the US – long frustrated with low European defence spending – is increasingly focused on affairs beyond the continent; China is growing in wealth and power; and Germany and France are seeking to frame the future of the EU, with Germany being particularly rigid in defence of its national interests. Rather than getting bogged down in a Brexit identity crisis, Britain must now have a more rigorous and forward-looking approach to the defence of Europe. Without a stable and liberal Europe, there can be no ‘Global Britain’; and there can be no stable and liberal Europe without British involvement and support. Now is the time for us to ensure that European security is fit for the coming decades – and it is essential that the Atlantic order remains supreme if we are to meet the challenge.